Congratulations to M. Austin who placed the winning bid of $2,000 for May's silent auction painting "Flowers and Fruit", by Valeri T. Nikitin, estimated at $3,500- $4,500. 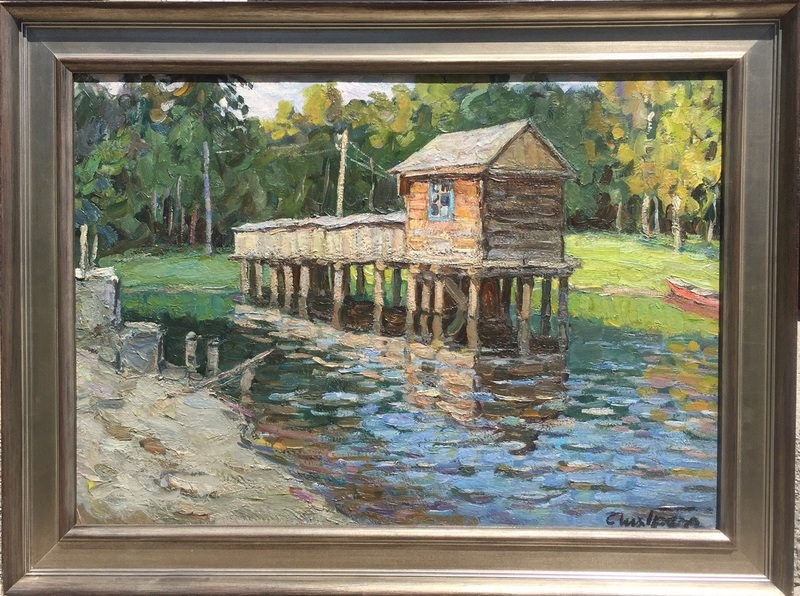 We are pleased to present as our May silent auction selection a wonderful landscape, "Old Water Tower", by Mikhail Frolovich Grachev, estimated at $4,000- $5,000. Grachev is an important 20th-century Soviet/Russian artist who enjoyed the respect and admiration of his peers. Grachev spent many years as the head of the Leningrad Artists Union. "Old Water Tower", explodes onto the canvass with color and bold brushstrokes that bring life and energy to a serene village scene. While this is clearly an idyllic countryside scene--it also contains a touch of political subtlety, the hope and success of communism. Notice the power lines-symbolizing the electrification of the countryside. One of the major national successes of the period. For the Soviet people, the Second World War was the overpowering event of their generation. The 30-year-old Grachev, of course, was affected and immediately after hostilities broke out against Russia, he volunteered. Over the next few years, the artist was sent to some of the most active battle fronts. While serving, the right-handed painter lost his right hand. Yet, he returned to the war. "Old Water Tower was complete, he had re-mastered his art--with much effort, using his left hand. Only 6 years after the war the artist had returned home, healed and was active in painting once again. Mikhail F. Grachev, "Old Water Tower"
We invite you to participate in this month's auction and thank everyone who placed bids last month. This is an exceptional opportunity to add a beautiful work by a noted artist to your collection. Estimated at $4,000 - $5,000, the current high bid is just $1,500! The next bid is $1,750, followed by minimum bidding increments of $250. Remember, there is no reserve, at the end of the auction the high bid wins! Bids will be taken via telephone, or e-mail until 7:00 pm MST, Monday, July 2nd. Follow all the bidding updates on the Gallery's website. 1951. Member of St. Peterburg's Union of Artists. Specialized in landscapes and genre scenes. Mikhail F. Grachev, the painter, was born in 1913. While still a small child he became an orphan. Since early childhood, he knew the difficulties and poverty. During the famine in 1921, he was taken to an orphanage in Tver, but then escaped from it and was a vagabond. He is very thankful to the priest Volynsky who helped him find a place in his life. He had to work at a factory, but his ability to draw, revealed itself in his childhood. 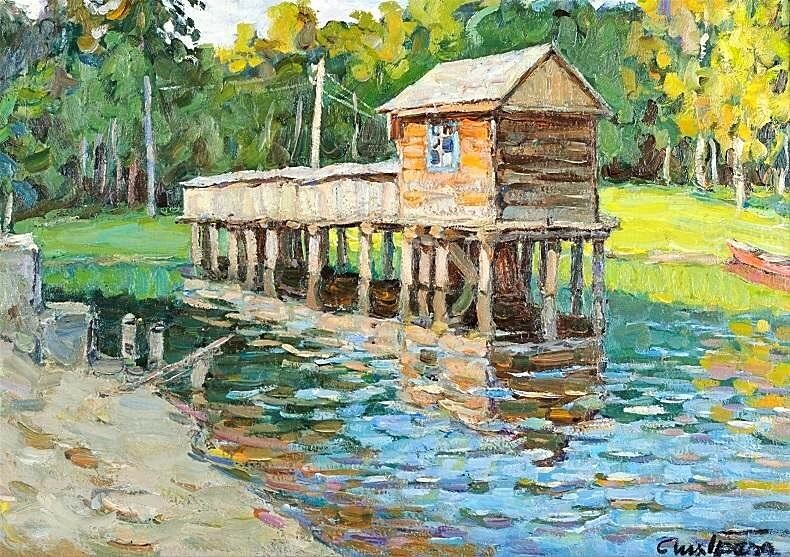 In 1932-1936 Grachev attended his first Art school. After finishing his studies there, he taught drawing and art in a secondary school. Before the beginning of the Great Patriotic War, he entered the Repin Institute of Painting, Sculpture and Architecture in Leningrad, but new trials were in store for him. Instead of continuing his studies, he joined the army. In 1942, he was seriously wounded and, as the result, he lost his right hand. His great courage and his great will helped him to use all his abilities and to become a student at the Academy of Arts. A disciple of Konashevich, he graduated from the Academy in 1948. His graduation work were illustrations to "The Tale of Prince Igor's Regiment". In 1949-1950, a book with Grachev's illustrations was published and sketches for the book were acquired by the Pushkin House. From the very beginning of his creative activities, Grachev has often been a participant of Leningrad, all Russia's and national exhibitions. The range of types of painting is very wide among his works; there are subject pictures, portraits, landscapes, still life paintings. Folk tales of which he has been fond since the times of his graduation work have occupied a special place in his works. Giants from Russian folk takes with their great courage and with their great power can be seen on his pictures. His landscapes are sincere and warm, they depict the scenery of Russia, as well as the scenery of the Crimea. There are such landscapes as In A Village (1961), Fishers (1968), Twilight (1965), The Last Warm Days (1965), Gurzuf (1967) and Artek (1969). In still life painting, the artist prefers bright colors showing his optimistic attitude towards life. Among these pictures are Flowers With A Shell (1964) and Peonies. For many years, Grachev worked as the head of the Leningrad branch of the Union of Artists. The artist was very fond of traveling. He visited many historic Russian vilages, the North, the Crimea, the Caucasus, and many European countries. Egypt, India and numerous travels to Italy inspired the artist giving him a fresh creative urge. The works of the artist can be seen in museums and private collections of Russia, France, Italy, Germany and the United States and other countries. Grachev, "Old Water Tower", framed. A fun new tradition at the TKM Gallery, every month we select a painting and hold a no reserve silent auction. Over the months there have been some 'steals' and some bidding wars but no matter the outcome, it has been exciting for our Russian art collectors. You can print the form, and either fax the completed form to (435-658-1730) or send a simple e-mail containing the information on the bid form via e-mail to info@mccartheygallery.net. Please be sure to include your full name, address, phone number, and email address. In the case of identical bids, the Gallery will give precedence to the first one received, so it is to your advantage to indicate a maximum bid, and to submit your bid as early as possible.